Editor’s note: The U.S. territory of Guam is comprised of 19 municipalities, or villages, many with their own distinct character and local flavor. They range from the larger more populated villages of Yigo and Dededo in the north, to their smaller rural counterparts like Merizo and Umatac on the island”s southern tip. Here are some of the more popular villages to help you start exploring. Village pride is evident in Mangilao where each side of Route 10 is lined with local murals depicting island life. The village is home to Guam’s largest secondary educational center, The University of Guam, located in the heart of Mangilao. Notable features of the UOG Campus are the Planetarium and the UOG Fieldhouse, one of the largest indoor venues on Guam. Many students live in this area, including Micronesian islanders, making Mangilao a culturally diverse village with a mix of houses and apartments. The Department of Agriculture is located just west of the Department of Corrections on Dairy Road Route 15. The Mangilao Golf course, with some of the most picturesque island views, is located east of the junction with Route 10 on Back Road to Anderson or Route 15. The most traffic by cars and persons on foot will be found on the streets surrounding Tumon Bay. This combination hotel row and retail section is a village of residential streets as well. Inland plateaus have been cut away from the descending hillside to form Marine Corps Drive and surrounding real estate as well as the Tumon strip. 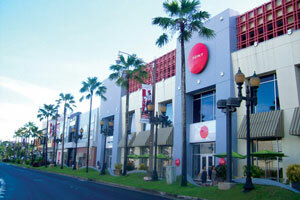 These two main drags provide access to the majority of the shopping and entertainment on Guam. Tamuning- Tumon is bordered by Dededo to the north. Marine Corps Drive, Route 1, and Army Drive, Route 16, creates a junction at the popular Micronesia Mall. This marks the beginning of the Village of Dededo traveling north on Route 1. To the south, the Villages of Agana and Mongmong border at the junction of Route 1 and Route 8. Within these boundaries are numerous Asian restaurants and bars, the international hotel chains, and the Guam Waterworks Authority. John F. Kennedy High School resides at the top of the hill in Tumon. Several car dealerships call this stretch of Marine Corps Drive home as well. Though predominantly tourist-oriented, many residents live in houses and condos overlooking Tumon Bay. 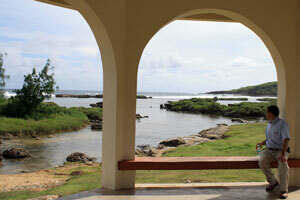 Going into Inarajan is like taking a step back in time through Chamorro history. It remains one of the most untouched by change, even being listed in the National Register of Historic Places in 1977. To really feel like you have stepped back onto an ancient island, stop by the Gef Pa’go Cultural Village, where you can walk through an ancient Chamorro village, compete with thatch-roofed huts and demonstrations of traditional arts and crafts. Among the most popular sites in Inarajan are the natural ocean side pools, aptly called, Inarajan Pools. The southern part of Guam is what most people imagine an island being like — sparsely populated with beautiful rolling hills and ocean views. The village of Yona is no exception. Check out Tagachang Beach for proof. 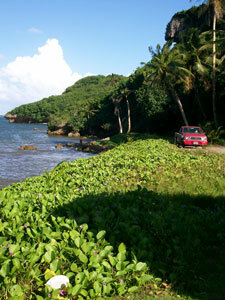 Yona (pronounced Joan-yuh) is the first southern village you will come to on the eastern side of the island. 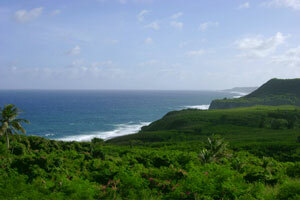 It is also one of the largest villages on Guam. 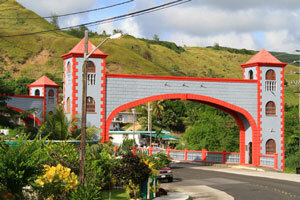 While it is mainly a residential area, there are some interesting attractions. There is the popular LeoPalace Resort with plenty of outdoor activities; locals enjoy going there to bowl, sing karaoke, and play golf. Golf enthusiasts can enjoy a selection of golf courses in Yona, including Country Club of the Pacific and Windward Hills Golf Course. Another interesting place to visit is Hamamoto Tropical Fruit World, a 50-acre fruit utopia with more than 70 varieties of tropical fruit. Take the tram ride through the jungle for $12 and then for $15 you can try all the fruit you have learned about on Fruit World’s lavish fruit buffet. In the main village, there is a Mobil gas station as well as a 7-Day Market for quick, although sometimes more expensive, groceries. The Mangilao Pay-Less Supermarket is a 5-10 min drive from central Yona. Micronesia Mall and the Tumon shopping district can be a 15-30 minute drive depending on traffic and the time of day, and it can take nearly 45 minutes to drive to Andersen Air Force Base and 30-40 minutes to the Navy Base.